This month's release by the Centers for Medicare & Medicaid Services (CMS) of a public use file on Medicare physician utilization and payment data creates both opportunities and threats for family physicians. We're going to consider both. On the plus side, the release of the Medicare data provides a great opportunity for the family medicine community to highlight the complexity of care that family physicians provide. Also, the data show wide variation in total payments made among various medical specialties(www.cms.gov), which reinforces the point that primary care physicians are underpaid relative to other specialists and sub-specialists. When that data set is further studied, it may make the case that family physicians, who provide comprehensive and time-intensive health care to their patients, are undervalued from a payer perspective. On the other hand, the Medicare data set has lots of limitations. For example, physicians weren't given an opportunity to review the data for potential errors; the data don't measure the quality of care provided; there's no allowance for residents or nurse practitioners filing claims under a physician's national provider identifier, meaning the payment numbers could be inflated; Medicare payments may not always cover the costs of treatment, which makes the numbers an inaccurate portrayal of physician compensation; the data are not risk-adjusted, don't account for patient mix or include care for private insurance patients or Medicaid beneficiaries; the numbers don't reflect the often higher reimbursements provided in facility settings versus a physician's office; and they don't consider changes in Medicare's coding and billing rules that may different over time and across regions of the country. • Insurers, hospitals, and accountable care organizations could use the data to assess physicians’ charges and potentially drop those individuals deemed to be high-cost physicians. • Public and private insurers might use the data as a reason to impose additional prior authorization requests for expensive Part B drugs. • The data set has the potential to paint a negative picture of some physicians with patients, and it also has the potential to further enhance the perception that physicians are overpaid relative to the average U.S. worker. • Greater transparency in the health care system is a laudable goal, and there is potential value in the release of Medicare payment data for ensuring the quality of care for patients and efficient use of resources in the delivery of health care services. • Release of this data shines a light on the need to reform physician payment away from fee-for-service and toward payment for quality of care. 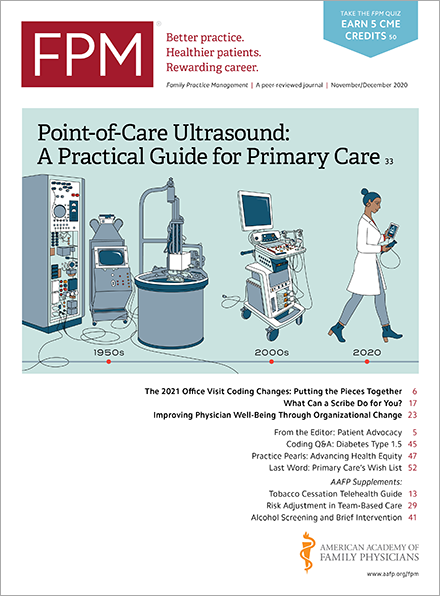 • Data should include context and background on physician payments so that policy makers, patients, and the public understand the overall quality of care their physicians provide. • The data release still needs safeguards to ensure that neither false nor misleading conclusions are derived from this information, which has its limitations. • Medicare payment information by itself does not describe a physician’s practice. • Hopefully, researchers will use this data to understand and improve how health care dollars are spent, so that we can also improve the health of patients, families, and communities. Whether the potential opportunities outweigh the potential threats remains to be seen. However, knowing what they are provides a starting point for trying to maximize the former while minimizing the latter. For more information on this subject, check out the AAFP's "Physician Payment Transparency" web page and read the frequently asked questions(questions.cms.gov) on the CMS website.